When family obligations forced Waxillium Ladrian to forsake the frontier lands and return to the metropolis of his birth to take his place as head of a noble House, he little imagined that the crime-fighting skills acquired during twenty years in the dusty plains would be just as applicable in the big city. He soon learned that there too, just being a talented Twinborn - one who can use both Allomancy and Feruchemy, the dominant magical modes on Scadrial - would not suffice. This bustling, optimistic, but still shaky society will now face its first test by terrorism and assassination, crimes intended to stir up labor strife and religious conflict. Wax, his eccentric sidekick Wayne, and brilliant, beautiful young Marasi, now officially part of the constabulary, must unravel the conspiracy before civil strife can stop Scadrial's progress in its tracks. Great story. Narration was great for most characters. 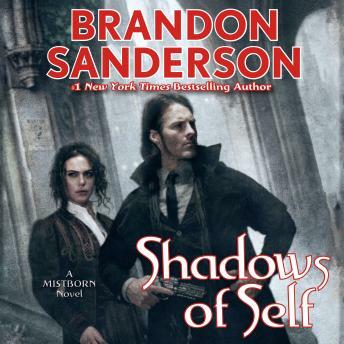 Another awesome read from Brandon Sanderson - great twists and turns and I hated turning it off! Can't wait for the bands of mourning to come out! I need to see how the story plays out!! And this narrator is just fantastic, the accents are done so well. Absolutely awesome, final twist was a kick to the stomach but man did I love it!